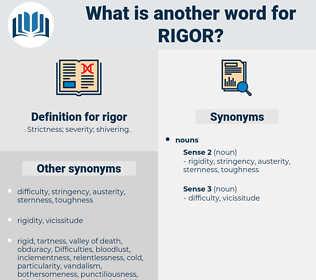 What is another word for rigor? thoroughness, rigidity, severity, stiffness, exactness, accuracy, rigorous, discipline, inflexibility, precision, toughness. ease, calm, happiness, calmness, leniency, health, elasticity, peace, pleasure, weakness. pliancy, roundness, indefiniteness, compliance, tolerance, carelessness, inaccuracy, break, kindness, flexibility, falseness, softness, incorrectness, lenience, guesswork, indulgence, responsiveness, willingness, pliability, advantage, vagueness, mildness, tenderness, falsity, inexactness, laxness, coarseness, looseness, patience, wrongness, opportunity, gentleness, impreciseness, roughness, approximation, imprecision, inexactitude, forbearance. 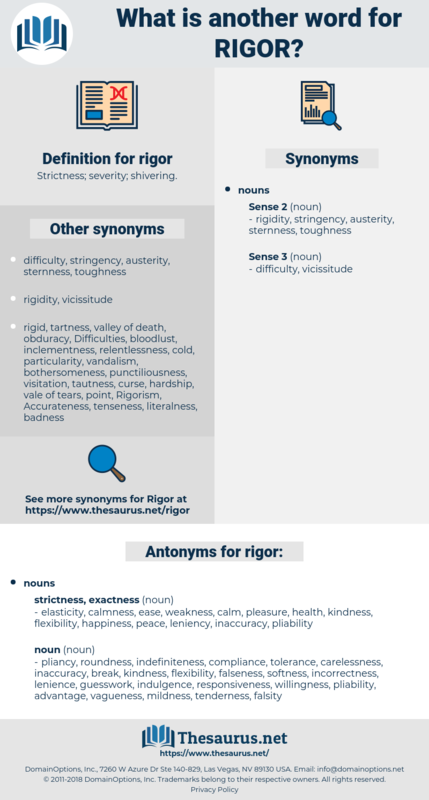 What's happened to all your rigor? Will not your chance of exposure, too, be so much the greater, as to make it incumbent upon him to pursue his determination with rigor? rescuer, race car, riser, rasher, rusher, rookery, rockery, rush hour, regur, rosary, rigour, reassure, recur, require, rigger, roguery, rigueur, rouser, rocker, racker, razor, rugger, raiser, racer, ricer, rocroi, regrow.